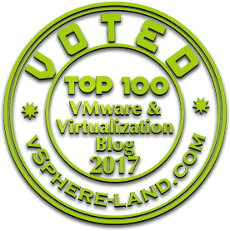 As most of you are aware that every year a list of Top Virtualization Blogger is released by v-sphere-land and Virtualization bloggers around the world are nominated for the same. Last year over 2,200 people voted from all over the world and when the votes were tallied the top 50 bloggers were revealed. Now it’s time to do it all over again as new blogs are born and old blogs fade away and bloggers move up and down the rankings. When casting your votes please keep the following in mind about the blogs. Here’s your chance to show your appreciation to the bloggers for all their hard work by picking your favourites which will determine the top blogs for 2016. Few Details to take into account before you start voting. You can now pick 12 of your favorite blogs (last year was 10) and also rank them in your order of preference after you pick your 12. The results will be weighted with a #1 ranking getting 12 points and a #12 ranking getting 1 point. Point totals will be tabulated and from them the top 50 will be determined. Blogs are listed on the ballot in alphabetical order, the current top 50 blogs are highlighted with their current ranking in parentheses and are also bolded so they stand out. So please go through the whole list when making your choices. Note there was a new minimum blog post requirement implemented this year to be eligible for Top vBlog voting, any blog that did not have at least 10 blog posts in 2015 is not included in the voting. Again this year we also having voting in special categories to help distinguish certain types of blogs. The categories are independent of the general voting so first pick and rank your top 12 overall favorite blogs and then choose your favorite blog in each category. Voting will run until 5/27, afterwards the results will be determined and announced on a special live podcast with myself, John Troyer and a special guest from VMTurbo. Duplicate vote protection is enabled, we’ll be using geolocation, IP addresses & cookies to protect against duplicate votes. If you are not familiar with a blog you can click on it in the survey to view it or use vLaunchpad to see links to them all. Try not to pick blogs based just on names but also take content into account.